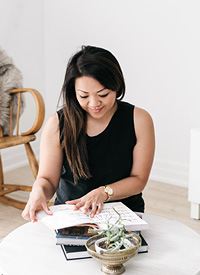 Bathroom Reveal — Love On Sunday Love On Sunday | Interior Styling in Toronto and the GTA. Say hello to my little black and white bathroom. I actually can’t help but smile as I type this because WE ARE DONE. Honestly, I can’t believe this is the same room. Even with a teeny, tiny budget, we managed to completely transform our main bathroom. It might not look like such a dramatic change in the photos but boy, it makes a world of a difference to wake up to this in the morning! For the floors, I originally wanted to go with small, mosaic tiles. But because it was a lot pricier, we opted for these larger 12x24 tiles that we found at a tile warehouse sale. Bonus! Well, I'm happy to report that I love how the floor turned out. Although we did have some issues with laying the tile, everything worked out in the end. I love the clean lines of our new floating vanity from Wayfair. As you can see, it's a lot less bulkier than the old vanity. It almost seems to disappear into the white wall. Goodbye dark brown, hello white! I searched high and low for a good quality faucet in matte black and this model from Wayfair fit perfectly. A few days ago, I posted this photo that my dear friend, Andreea shot while she was in Mexico. I loved it so much and it was the perfect dose of colour this bathroom needed. It also feeds my wanderlust which is always a good thing, right? If you want to get your hands on some beautiful art for your home, check out her new shop here and use the coupon code ESCAPE for 25% off! Ok, a shelfie in the bathroom? Instead of hanging a traditional shelf over the toilet, I opted for a picture ledge. I wanted to keep things extremely minimal but also functional. A bigger shelf meant more stuff and we wanted to reduce stuff in this tiny bathroom. Now my favourite soaps are in arms reach. I found this cute, black & white canvas basket for a steal at Simons. It's perfect for holding extra rolls of toilet paper. Let me tell you, this simple towel bar makes SUCH a difference. We lived with those awful towel hooks for years and we couldn't dry anything on them. Also, the matte black was a no brainer. I paired it with one of my watercolours in a simple white frame. And that's about it, folks. This bathroom would not be possible without the help of my Dad and husband, David. Thank you for putting up with me these past 5 weeks. Thanks to Tan and Brian for helping us fix the floor (if you're reading this, you guys rock!). Also, a big thanks to Linda from Calling it Home for creating the One Room Challenge and of course to my wonderful sponsors, Wayfair! There are so many amazing makeovers this season. If you're looking for some inspiration for your home, have a look at the other featured designers here and the guest participants here. Vanity: currently sold out but you can find similar options here.